As in World War I, the metallic composition of coinage had to be altered during World War II. Owing to the increased demand for nickel from the war-related industries, the government decided to mint the 5-cent coin from tombac, an alloy of zinc and copper with a colour similar to that of a penny. To avoid confusion, the new 5-cent coin had twelve sides. 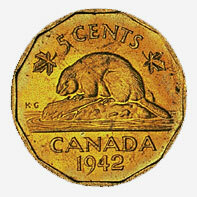 The 1943 coin had a morse-code message around its edge that read: "We win when we work willingly," a reminder to Canadians to redouble their efforts to win the war.